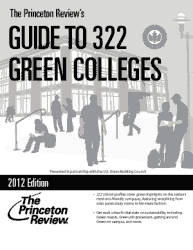 The University of Wisconsin-Green Bay was notified this week it has been selected for inclusion in the free, downloadable book, The Princeton Review’s Guide to 322 Green Colleges: 2012 Edition. The publishers bill their product — created in partnership with the U.S. Green Building Council — as focusing “solely on colleges that have demonstrated a notable commitment to sustainability.” They say they chose the 322 schools based on a survey conducted in 2011 of 778 colleges in order to include a green metric in their popular college guidebooks and websites. UW-Green Bay is new to the Green Colleges guide, now in its third year. Schools are listed, but not ranked. Other Wisconsin schools in the guide are Marquette University, Northland College and the UW campuses at Eau Claire, Madison, Milwaukee and Stevens Point. See a state-by-state list. “UW-Green Bay is affectionately dubbed ‘Eco U,’ and for good reason. ‘Environmental research and applied ecological sciences were the focus of the institution’s educational philosophy at its inception,’ and UW-GB’s support of ecological research is both elaborate and wholehearted.”… The short writeup also includes mention of EMBI, the Environmental Management Business Institute, and its commitment to education and research regarding local, regional, and global environmental problems… The summary notes UW-Green Bay has “historically strong academic programs” in the environmental sciences at both the bachelor’s and master’s level, and makes specific mention of The Capstone Seminar in the Environmental Science and Policy for tackling topical issues… Also noted are Mary Ann Cofrin Hall and its integrated photovoltaic system, the Cofrin Memorial Arboretum, “a detailed recycling program” and transportation alternatives… UW-Green Bay is included in the lengthy lists of schools that hold the STARS rating (Oshkosh and River Falls among the UWs) and that are signatories to the ACUPCC pledge (Eau Claire and Stevens Point, too). You can check out the University’s profile in the guide and download the full guide, click here. This entry was posted in Headlines and tagged achievements, environment, Green Colleges guide, sustainability on April 18, 2012 by Christopher Sampson.